You might remember these two beautiful humans from their surprise engagement we helped plan last year, but if not I would like to introduce you to Emily and Peter…The Shankland’s! They got married on a sunny November morning at Fern in Cincinnati. It was the first wedding ever to be held there, and I really hope it’s not the last! It was perfect for Peter and Emily’s intimate wedding gathering with their friends and family. Coffee is a big part of their lives, that’s how they met, in a coffee shop in Cincinnati, so it only seemed fitting to have a brunch inspired wedding. There was a coffee truck from Collective Espresso and a full spread of beautiful pastries to go along with it. The space was decorated with stunning florals from Una Floral and there were tons of P.F. Candle Co. candles burning, it smelt like heaven. Before they even did their first look there were tears, mainly from Peter, because he’s such a big softy and we love him for that! They did their first look out in the parking lot of Fern bathed in the light of the morning sun. I would have to say it’s the best first look I have ever got the chance to see, so much joy filled tears. 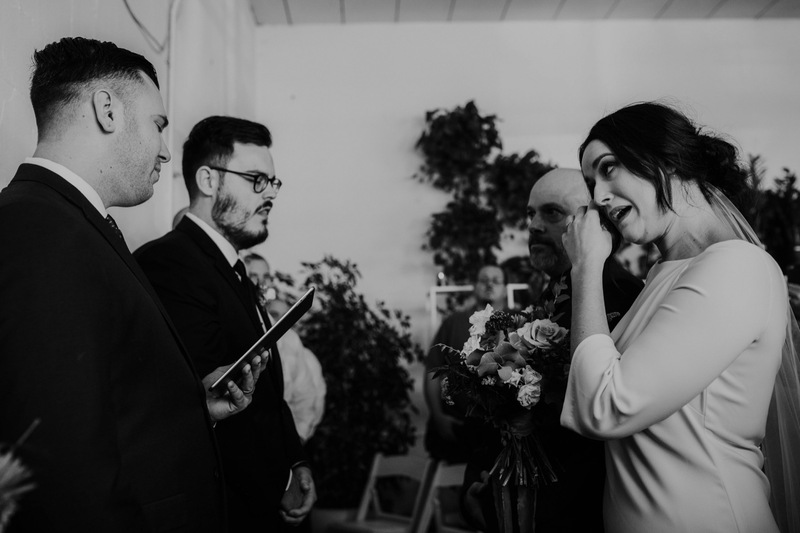 Their ceremony was officiated by one of their close friends, it was them to a tee and I am pretty sure there wasn’t a dry eye in the room. Between the moments of laughter and the ones of loving tears they got married and are now The Shankland’s!! And off we went to their reception, with a few stops for more photos along the way. Let’s take a moment to talk about their reception, because it was so dang amazing! They reserved a couple tables at Rhinegeist Brewery in Cincinnati and ordered 50 pizzas to share with their wonderful group of humans. There was speeches and cake AND beer, of course. My favorite part of it all was when they entered the wide open space of the brewery and everyone, not just their friends and family, started to clap and cheer for them. It was beautiful and lovely and just about every other wonderful descriptive word I can possible think of. Peter and Emily’s wedding day was about uniting their families, getting married and having a chill day just to soak in the love from everyone around them and of course to celebrate the love they have for one another! Spolier alert: They went to LA + Joshua Tree for their honeymoon…AND we crashed it. We drove from Ohio to Joshua Tree to do photos of them on their honeymoon, I am so excited to share those photos with you guys too! !